404) Death of a Martyr, 203 A. D.
The Roman persecution of Christians began during the reign of Nero and persisted until Christianity was recognized as a legitimate religion by the Emperor Constantine 249 years later. This persecution was justified by the belief that the Christians’ refusal to pay homage to Rome’s pagan gods provoked their wrath. The disastrous consequence of a flood, drought, earthquake, or other calamity, was often attributed to the Christians’ lack of piety and the resultant retribution of the gods. Christians were denounced as enemies of men and the gods and therefore subject to the severest tortures. Conviction did not lead inevitably to execution. Pardon would be granted if the Christian threw a few grains of incense on the altar of the pagan god and thereby recognize its dominance. If this offer was refused, more severe measures such as scourging or other tortures were implemented. If these failed, the victim was lead to the circus or theater and subjected to a horrible death for the amusement of the crowd and the placation of the gods. 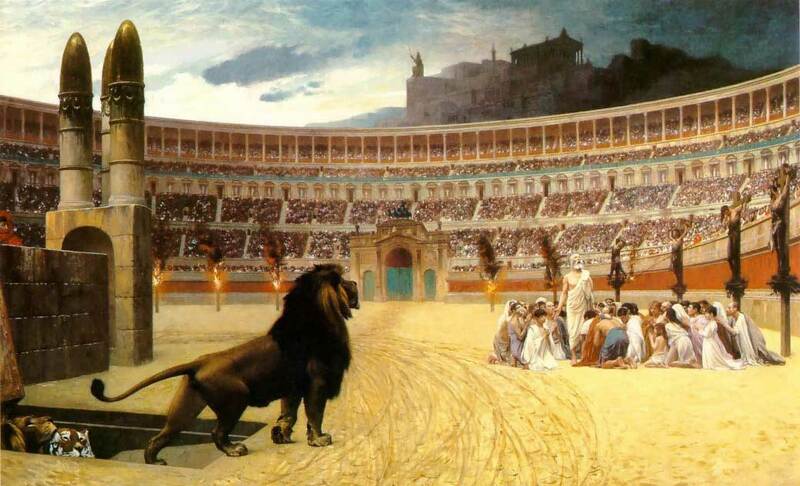 Perpetua was one of five Christians condemned to death in the arena. One of her companions, Felicitas, was a slave and eight months pregnant. Two days before her execution she gave birth to a daughter. Pepetua’s father was a pagan and came often to the prison (many times with Perpetua’s son in his arms) to plead with his daughter to renounce her religion and save her life, but to no avail. On March 7 Perpetua and her four companions were led to the arena where the crowd demanded they be scourged. Then a boar, a bear, and a leopard were loosened upon the men while the women were attacked by a wild bull. Wounded, Perpetua was then put to the sword. Perpetua: “When I was in the hands of the persecutors, my father in his tender solicitude tried hard to pervert me from the faith. So he went away, but, on the rumor that we were to be tried, he wasted away with anxiety. I Peter 5:6-10 — Humble yourselves, therefore, under God’s mighty hand, that he may lift you up in due time. Cast all your anxiety on him because he cares for you. Be self-controlled and alert. Your enemy the devil prowls around like a roaring lion looking for someone to devour. Resist him, standing firm in the faith, because you know that your brothers throughout the world are undergoing the same kind of sufferings. And the God of all grace, who called you to his eternal glory in Christ, after you have suffered a little while, will himself restore you and make you strong, firm and steadfast. MARTIN LUTHER’S PRAYER IN THE FACE OF DEATH: My dear God, if you so desire that this be my last hour, then let thy will be done,… and I shall gladly die. Only let your holy name be praised and glorified by my sufferings and death. If it were possible, dear Lord, I would live longer for the sake of your blessed people. But if the hour has come, then do as you please, for you are the Lord of life and death. Amen. 403) Nero Persecutes the Christians, 64 A. D.
A generation after the death of Christ, Christianity had reached Rome in the form of an obscure offshoot of Judaism popular among the city’s poor and destitute. Members of this religious sect spoke of the coming of a new kingdom and a new king. These views provoked suspicion among the Jewish authorities who rejected the group, and fear among the Roman authorities who perceived these sentiments as a threat to the Empire. In the summer of 64 A. D. Rome suffered a terrible fire that burned for six days and seven nights consuming almost three quarters of the city. The people accused the Emperor Nero for the devastation, claiming he set the fire for his own amusement. In order to deflect these accusations and placate the people, Nero laid blame for the fire on the Christians. The emperor ordered the arrest of a few members of the sect who, under torture, accused others until the entire Christian populace was implicated and became fair game for retribution. As many of the religious sect that could be found were rounded up and put to death in the most horrific manner for the amusement of the citizens of Rome. The ghastly way in which the victims were put to death aroused sympathy among many Romans, although most felt their execution justified. The following account was written by the Roman historian Tacitus in his book Annals published a few years after the event. Tacitus was a young boy living in Rome during the time of the persecutions. Therefore, to stop the rumor (that he had set Rome on fire), he (Emperor Nero) falsely charged with guilt, and punished with the most fearful tortures, the persons commonly called Christians, who were (generally) hated for their outrageous wickedness. Christus, the founder of that group, was put to death as a criminal by Pontius Pilate, procurator of Judea, in the reign of Tiberius. But the pernicious superstition, repressed for a time, broke out yet again, not only through Judea, where the mischief originated, but through the city of Rome also, whither all things horrible and disgraceful flow from all quarters, as to a common receptacle, and where they are encouraged. Accordingly, first those were arrested who confessed they were Christians; next on their information, a vast multitude were convicted, not so much on the charge of burning the city, as of “hating the human race.” In their very deaths they were made the subjects of sport: for they were covered with the hides of wild beasts, and (put in the arena) to be killed by dogs, or nailed to crosses, or set fire to, and when the day waned, burned to serve for the evening lights… For this cause a feeling of compassion arose towards the sufferers, though guilty and deserving of exemplary capital punishment, because they seemed not to be cut off for the public good, but were victims of the ferocity of one man. The New Testament book of I Peter was written in Rome, probably around the time of Nero’s persecution, perhaps to give hope and encouragement to Christians undergoing persecution. Eternal Lord God, you hold all souls in life: Give to your church in paradise and on earth your light and your peace; and grant that we, following the good examples of those who have served you here and are now at rest, may at last enter with them into your unending joy; through Jesus Christ our Lord, who lives and reigns with you and the Holy Spirit, one God, for ever and ever. Amen. By Tony Campolo, Let Me Tell You a Story, copyright 2000, pages 89-90. The story is told of a young lieutenant in World War II whose unit was ambushed by Nazi soldiers. Almost all of them escaped from the flying bullets by running into an old farmhouse. However, out of the darkness came the moans and groans of one of the men who had been severely wounded. The young lieutenant did the heroic thing. He crawled out into the night, grabbed the young recruit, and dragged him to the safety of the farmhouse. He saved the man, but even as he himself was going through the door to safety, he was struck by a bullet to his head and killed instantly. A year or so later the young man for whom the lieutenant had heroically given his life was back in the States. The parents of the dead hero asked to meet him. On the appointed night, the soldier came to meet the mother and father of the man who had died for him. But when he arrived at the house where they lived, it was obvious to the parents of the dead hero that he was drunk. They sat at dinner and tried to make conversation, but the man was loud and at times, obscene. Toward the end of the meal he vomited. The parents did the best they could do to make their way through a horrendous evening of suffering. I’m sure that when the angels in heaven look upon the behavior of the likes of someone like me, they must say to one another, “To think that God’s precious Son had to die for somebody like that.” I owe Him better. He gave His life for me and I should be ready and willing to do what He would do if He was in my place. Romans 5:6-10 — You see, at just the right time, when we were still powerless, Christ died for the ungodly. Very rarely will anyone die for a righteous person, though for a good person someone might possibly dare to die. But God demonstrates his own love for us in this: While we were still sinners, Christ died for us. Since we have now been justified by his blood, how much more shall we be saved from God’s wrath through him! For if, while we were God’s enemies, we were reconciled to him through the death of his Son, how much more, having been reconciled, shall we be saved through his life! Guide the rulers of all nations, so that they may lead their land and their people in righteousness and peace. Enlighten all who are in authority and move them to do what is right. Grant blessed unity and peace among all nations. Preserve us from all strife, hatred, and warfare, so that we may eat our daily bread in peace. Amen. (…continued) When you get down to it, is not the popular idea of Christianity simply this: that Jesus Christ was a great moral teacher and that if only we took his advice we might be able to establish a better social order and avoid another war? Now, mind you, this is quite true. But it tells you much less than the whole truth about Christianity and it has no practical importance at all. It is quite true that if we took Christ’s advice we should soon be living in a happier world. You need not even go as far as Christ. If we did all that Plato or Aristotle or Confucius told us, we should get on a great deal better than we do. And so what? We never have followed the advice of the great teachers. Why are we likely to begin now? Why are we more likely to follow Christ than any of the others? Because he is the best moral teacher? But that makes it even less likely that we shall follow him. If we cannot take the elementary lessons, is it likely we are going to take the most advanced one? If Christianity only means one more bit of good advice, then Christianity is of no importance. There has been no lack of good advice for the last four thousand years. A bit more makes no difference. There is no good complaining that these statements are difficult. Christianity claims to be telling us about another world, about something behind the world we can touch and hear and see. You may think the claim false; but if it were true, what it tells us would be bound to be difficult– at least as difficult as modern Physics, and for the same reason. John 20:30-31 — Jesus did many other miraculous signs in the presence of his disciples, which are not recorded in this book. But these are written that you may believe that Jesus is the Christ, the Son of God, and that by believing you may have life in his name. John 1:1-4…10-12…14 — In the beginning was the Word, and the Word was with God, and the Word was God. He was with God in the beginning. Through him all things were made; without him nothing was made that has been made. In him was life, and that life was the light of men… He was in the world, and though the world was made through him, the world did not recognize him. He came to that which was his own, but his own did not receive him. Yet to all who received him, to those who believed in his name, he gave the right to become children of God… The Word became flesh and made his dwelling among us. We have seen his glory, the glory of the One and Only, who came from the Father, full of grace and truth. O almighty God, who hast instructed thy holy Church with thy heavenly doctrine; give us grace, that, being not like children carried away with every blast of vain doctrine, we may be established in the truth of thy holy Gospel, through Jesus Christ our Lord. Amen. Everyone has warned me not to tell you what I am going to tell you in this last book. They all say “the ordinary reader does not want Theology: give him plain practical religion.” I have rejected their advice. I do not think the ordinary reader is such a fool. Theology means “the science of God,” and I think any man who wants to think about God at all would like to have the clearest and most accurate ideas about Him which are available. You are not children: why should you be treated like children? Now in a sense I quite agreed with that man. I think he had probably had a real experience of God in the desert. And when he turned from that experience to the Christian creeds, I think he really was turning from something real to something less real. In the same way, if a man has once looked at the Atlantic from the beach, and then goes and looks at a map of the Atlantic, he also will be turning from something real to something less real: turning from real waves to a bit of colored paper. But here comes the point. The map is admittedly only colored paper; but there are two things you have to remember about it. In the first place, it is based on what hundreds and thousands of people have found out by sailing the real Atlantic. In that way it has behind it masses of experience just as real as the one you could have from the beach; only, while yours would be a single glimpse, the map fits all those different experiences together. In the second place, if you want to go anywhere, the map is absolutely necessary. As long as you are content with walks on the beach, your own glimpses are far more fun than looking at a map. But the map is going to be more use than walks on the beach if you want to get to America. Now, Theology is like the map. Merely learning and thinking about the Christian doctrines, if you stop there, is less real and less exciting than the sort of thing my friend got in the desert. Doctrines are not God: they are only a kind of map. But that map is based on the experience of hundreds of people who really were in touch with God– experiences compared with which any thrills or pious feelings you and I are likely to get on our own are very elementary and very confused. And secondly, if you want to get any further, you must use the map. You see, what happened to that man in the desert may have been real, and was certainly exciting, but nothing comes of it. It leads nowhere. There is nothing to do about it. In fact, that is just why a vague religion– all about feeling God in nature, and so on– is so attractive. It is all thrills and no work: like watching the waves from the beach. But you will not get to Newfoundland by studying the Atlantic that way, and you will not get eternal life by simply feeling the presence of God in flowers or music. Neither will you get anywhere by looking at maps without going to sea. Nor will you be very safe if you go to sea with out a map. In other words, Theology is practical: especially now. In the old days, when there was less education and discussion, perhaps it was possible to get on with a few simple ideas about God. But it is not so now. Everyone reads, everyone hears things discussed. Consequently, if you do not listen to Theology, that will not mean that you have no ideas about God. It will mean that you have a lot of wrong ones– bad, muddled, out-of date ideas. For a great many of the ideas about God which are trotted out as novelties today, are simply the ones which real Theologians tried centuries ago and rejected. To believe the popular religion of modern England is retrogression– like believing the earth is flat. Titus 1:9 — He (an elder) must hold firmly to the trustworthy message as it has been taught, so that he can encourage others by sound doctrine and refute those who oppose it. I Peter 3:16 — In your hearts set apart Christ as Lord. Always be prepared to give an answer to everyone who asks you to give the reason for the hope that you have. But do this with gentleness and respect. 1. Prayer is the great remedy against anger. When we get angry we ought to say a prayer before we say anything else, and as we approach God in prayer we will lay aside our anger, and the curing of the anger will then be the effect and blessing of our prayers. 2. If anger arises in your heart, instantly seal up thy lips and let it not go forth, for anger is like fire in that when it lacks ventilation, it is suppressed. Anger is a fire, and angry words are like breath to fan it; together they are like steel and flint sending out fire by mutual collision. Some men can talk themselves into an angry rage, and if their neighbor is also enkindled, together they are enraged. 3. Humility is the most excellent natural cure for anger in the world, for he who considers his own failings and remembers that he daily needs God’s pardon and his brother’s forgiveness, will not be as apt to rage at the wrongdoings, irritations, or indiscretions of another. 4. Consider the example of the Lord Jesus, who often suffered at the hands of sinners, and received many insults and reproaches from malicious, rash, and foolish persons; and yet in all of them he was calm and gentle. For if Jesus, though innocent, suffered such great injuries and disgraces, we should be able to quietly endure all the calamities of misfortune, the indiscretion of fellow workers, the mistakes of friends, the irritations of kindred, and the rudeness of enemies, since we deserve this and worse, even hell itself. 5. Remove from yourself all provocations and incentives to anger; especially, (a) Games of chance with great wagers. Be indifferent toward such external things, and do not get passionate upon them, for they are not worth it. (b) Do not heap up valuables, jewels, glasses, or precious stones, because much may happen in the spoiling or loss of these treasures, and that becomes an irresistible cause of anger. Those that desire few things, have fewer things to anger them. (c) Do not listen to tale-bearers, for the tales they tell can make us angry; and, it all may be a lie– but even if it be true, it is a matter for God‘s forgiveness and not our conversation. And it will serve us well, as much as we are able, to choose to be with peaceable persons. If we are with peaceful and prudent persons, they will not easily occasion our disturbance. 6. Be not inquisitive into the affairs of other men, nor the faults of thy fellow workers, nor the mistakes of thy friends. And when you do hear something hurtful to yourself, be ready to forgive as you have been forgiven. But do not look for trouble, for that is like gathering sticks to kindle a fire to burn your own house. 7. Use all reasonable means to understand the faults of others, considering that there are many circumstances of time, person, accident, inadvertency, infrequency, aptness to amend, and sorrow for doing it. 8. In contentions be always passive, never active; upon the defensive, not the assaulting part. And then give a gentle answer, receiving the furies and indiscretions of the other, like a stone into a bed of moss and soft compliance, and you shall find it will quiet down more quickly; whereas returning anger with anger makes the contention loud and long, and injurious to both the parties. FURTHER THOUGHTS… 1. Anger is an enemy to sound counsel. It is a storm out of which no man can be heard to speak. 2. Of all emotions it does the most to make reason useless. 3. Uncontrolled anger ends up being troubled at everything, every person, and every accident, and unless it is suppressed, it will make a man always restless. 4. If it proceeds from a great cause it turns to fury; if from a small cause it is peevishness; and so is always either terrible or ridiculous. 5. It makes a man’s body contemptible, with the voice horrid, the eyes cruel, the face pale or fiery, the gait fierce, the speech clamorous and loud. 6. It is troublesome not only to those that suffer it, but to them that must behold it. 7. It makes marriages, friendships, and societies to be intolerable. 8. It makes innocent jesting to be the beginning of tragedies, turning friendship into hatred. It turns the desire for knowledge into an itch for wrangling. It turns justice into cruelty, and judgment into oppression. Anger contains all the worst passions; there is in it envy and pride and scorn, rashness and inconsideration, rejoicing in evil and a desire to inflict it, self-love and impatience. 9. And, lastly, though anger is very troublesome to others, yet it is most troublesome to him that has it. And observe that anger is wrong when it is against charity to myself or my neighbor; but anger against sin is a holy zeal, and a result of love to God and my brother, for whose interest I am passionate. And if I take care that such anger makes no reflection of scorn or cruelty upon the offender, or of pride to myself, then that anger becomes charity and duty. Proverbs 29:11 — A fool gives full vent to his anger, but a wise man keeps himself under control. Ecclesiastes 7:9 — Do not be quickly provoked in your spirit, for anger resides in the lap of fools. Just a month ago, on the other side of the world, I saw it happen. From a human point of view the circumstances were all wrong. The speaker was a Western female in a male-dominated society in the Eastern world. She was not a native speaker of the language she used. Only about half of the listeners spoke that language as their first tongue. The audience, with the exception of two small girls, was made up of adult males. The traditional stance of all was anti-Christian. The story was told with a flannel graph, an aid normally used with children. What could one hope for under these circumstances? Heckling? Boredom? Walkouts? Antagonism? Indifference? There was no introduction. No invitation: “Let’s talk.” No apology for taking their time or interrupting their activities, not even a “thanks for coming.” The storyteller walked into the hospital ward and announced to the patients and to the relatives who were accompanying them, about 50 in total, “We are going to have a lesson now.” She set up a flannel board and started telling the story of Jesus. In half an hour she took them from the angel’s announcement to Joseph, all the way to the resurrection. From the first sentence she spoke to the final word, the audience was enrapt. I did not understand the language, so I occupied myself with observing the listeners. It was obvious that the Holy Spirit was at work. There were no objections. No questioning of motives or authority. The only reaction was a drinking in of the Word, and many request for the written Gospel in their mother tongues. The theologian was right. Just tell them about Jesus! 1 John 1:1-3 — That which was from the beginning, which we have heard, which we have seen with our eyes, which we have looked at and our hands have touched—this we proclaim concerning the Word of life. The life appeared; we have seen it and testify to it, and we proclaim to you the eternal life, which was with the Father and has appeared to us. We proclaim to you what we have seen and heard, so that you also may have fellowship with us. And our fellowship is with the Father and with his Son, Jesus Christ.